Sekiro: Shadows Die Twice has an official release date. The ninja action game developed by Dark Souls and Bloodborne developer, From Software, is officially coming out on March 22, 2019 for PlayStation 4, Xbox One, and Steam. 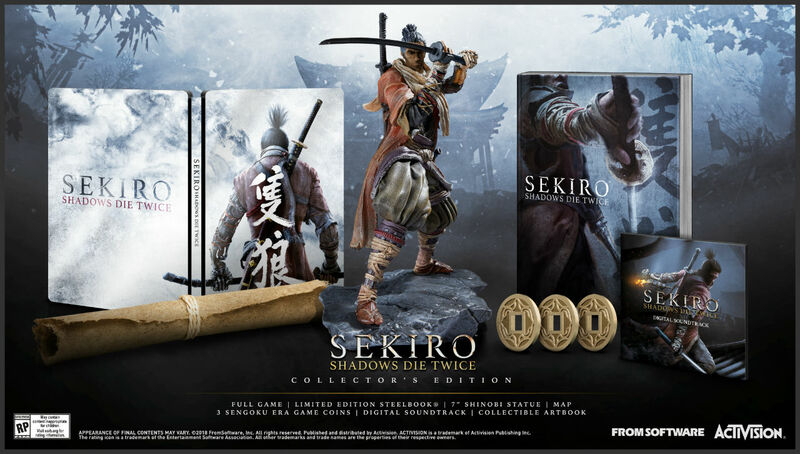 A collector's edition was also announced and is available for pre-order today. In addition, Activision and From Software revealed some new details about Sekiro from Gamescom 2018. We previously talked about the prosthetic tool wielded by Sekiro's main "one-armed wolf" protagonist. It's revealed that this prosthetic can be upgraded to unlock powerful charge attacks. We got a chance to speak with Sekiro director Hidetaka Miyazaki about the upcoming ninja game on what we can expect to see from Sekiro in terms of weapon diversity, why he chose to go with ninjas as protagonists, and what we can expect from the next-generation of From Software games. USgamer is at Gamescom so check back with more breaking news and previews. While you're at it, read our Sekiro: Shadows Die Twice guide for all the latest release info, previews, and trailers. Tagged with Action,	Activision,	FromSoftware,	gamescom,	News,	PC,	PlayStation 4,	Xbox One.